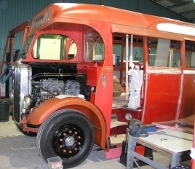 Supplied new to United Automobile of Darlington, this bus entered service as fleet number BLO 133 (Bristol L, Oil engine.) The body was built by ECW in Irthlingborough, Northants, after the Lowestoft factory had been evacuated in May 1940 due to fears of coastal invasion. The body cost was £530 and the vehicle was collected on the 3rd January 1941. 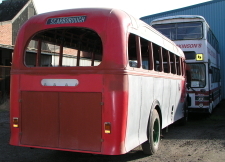 In 1947, it received a similar body from bus BLO 97, vehicle body swaps on overhaul being quite common at United. 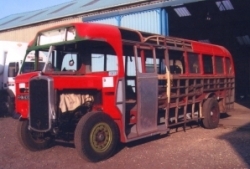 In 1951, the bus visited ECW (now returned to Lowestoft) for a re-build. Shortly after this, it was re-numbered BG 147 (Bristol, Gardner engine). Depot allocations with United included Scarborough. 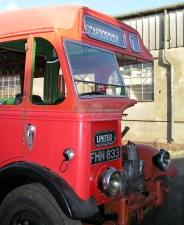 Withdrawn by United in 1957, it was sold to Passenger Vehicle Disposals of Rugby on 12th July 1957. 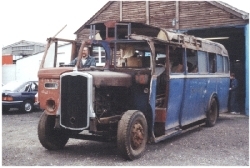 This bus spent its final working days with Messrs Alexander (trading as Greyhound) of Sheffield, one of the first of many second-hand Bristol L's joining that fleet, principally for contract duties - in the case of No 23 (as FHN 833 became) usually carrying workmen from the Lincoln area to power stations then under construction in the Trent Valley. A photograph of No. 23 with Greyhound (at Nottingham) can be seen here - on the Bristol L Web Site. It was purchased for preservation by the Society in 1963 and restoration commenced in 1970, but proved to be problematical due to the intricate curved wooden body frame, and progress came to a halt. 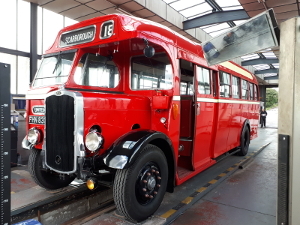 Restoration commenced again in the late 1990s, and good progress has been made in recent years with the bus returning to running order in 2018 - 55 years after carrying its last passengers in service! A new rear bonnet section has been fabricated and new studs made to fit to the existing bulkhead bracket. The radiator grill has been the subject of welding work before it was primed and painted prior to fitting. New screws were sourced before the grill could be mated up and assembled using copper grease and wax oil where needed. Finally the radiator was re-polished and the radiator blind lugs fitted after certain holes were tapped. The engine block water transfer pipe has been repaired and refitted with new mounting studs being made. This entailed removal of the rocker covers and air inlet manifold, and the oil delivery to the rockers was checked before refitting. The top of the engine was cleaned and the rocker covers polished. A new rubber bypass hose was fitted and new studs were made for the air inlet manifold to replace the missing originals. 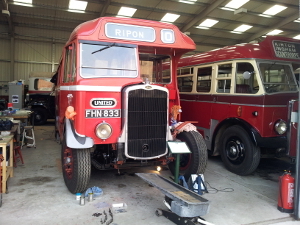 The lower windscreen has been realigned and the frame cleaned ready for some new glass. 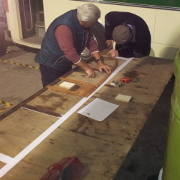 Work has continued scrubbing part of the body floor and rectifying faults with the coving panels. The seat rails have also been cleaned and painted and new seat brackets for the same have been designed and fabricated locally. Views of FHN 833 in November 2008. A great step forward was the fitting of the new lino recently, a super colour match being obtained! The lino has also been fitted to new panels for the front bulkhead, and these should be installed before long. Some re-chroming of interior parts has been undertaken, including the saloon heater units and stanchion pole fitments, amongst others. In the cab new interior panels have been cut, painted and fitted together with the new door check strap and door lock. New interior panels also have been fitted to the emergency door. A new rear seat frame has been manufactured and the correct seat moquette obtained for the upholstery of this unit. 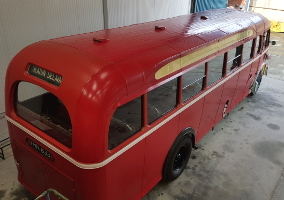 The 'rain' strip has been painted on the reverse in 'Tilling' red and now fitted above the windows, and the body mouldings in the advertising panels are also in place, being the final strips to go on the exterior. Sound proofing material was sourced at a stall when visiting a local car rally and this will go into the bulkhead section soon. A new rear glass registration plate has been manufactured. The two interior stanchion poles have been shot blasted and powder coated in the correct colour, one of the poles being expertly repaired beforehand. 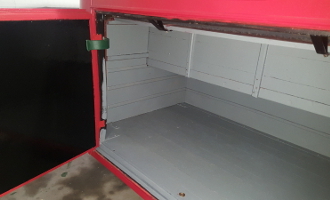 Cab interior panels, the ticket box and interior 'decency' screen have been repaired as necessary and painted. 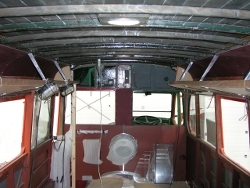 Front bulkhead, showing soundproofing material being installed. Oct 2009. Cab door, Oct 2009. Floor following fitting of new lino, Oct 2009. January 2010 - Following the Open Day FHN has been repositioned in the Museum behind the new rear door so that work can continue whilst the development of the site is underway. The front bulkhead lower interior panels are now fitted with the emergency door check strap in place. The stanchion poles recently powder coated in the original colour are now fitted with the re-chromed fixings, as are the heater surround, decency screen and 'used ticket' box. Current projects are the renovation of the upper bulkhead (lots of trim needs to be made) and floor treads being screwed down. 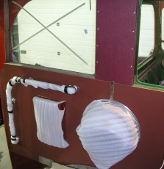 October 2010 - Recent work has included new interior roof panels being fitted, the curved ones being upholstered in red and the ceiling being prepared for later attention with cream lionide after being treated. 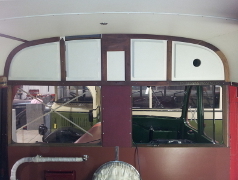 The bulkhead wood trim has been restored and replaced as necessary and now looks superb. 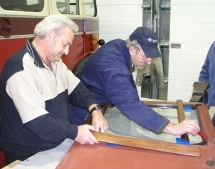 Templates have been made for new window glass, and a steam unit constructed to bend the interior wood trim as required. The emergency door has been trimmed and the steering wheel renovated. The bulkhead fuel filter has been repaired to stop a mild leak. 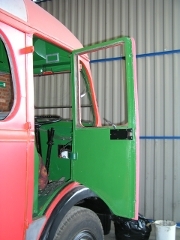 Front nearside view, November 2010 Fitting trim to door. Why are all four corner brackets different?? November 2010 Front bulkhead. Handrail, used ticket box and Clayton heater are wrapped to avoid accidental damage. November 2010. January 2011- The majority of the fixed glass has been cut and fitted thanks to local firm ABC Windows, and the interior wood trim is being fitted on a temporary basis to see what pieces are missing (there are a few!) before the final varnishing. The passenger door and surrounds are receiving more attention to achieve a decent fit. The luggage rack support brackets have now been received and are being 'finished off' as necessary. April 2011 - More interior work has seen the manufacture and fitting of the wooden luggage racks throughout - it looks superb! The lower body guard rails have been fitted and the roof exterior painted in Tilling Red' at last. 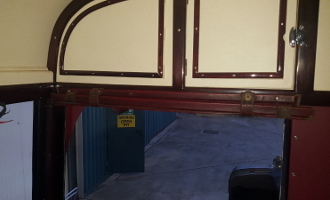 The saloon buzzer wiring has been completed through the luggage racks and tested. July 2011 - Final 'tweaking' of the luggage racks and the manufacture of the first aid box compartment are underway, together with more paint preparation to the exterior. 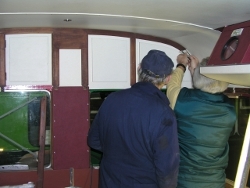 Windows are being fitted to the cab area. October 2011 - All the ceiling panels have now been covered with white 'lionide' - a job not without some anxiety! The luggage racks have also received hard wearing vinyl to their interior surface, as a starting point too. On the exterior the rear corner panels, boot doors, cant rail panels and passenger door area have been receiving more attention prior to painting in top coat which is now underway; ditto with the bonnet top and side. Work is also ongoing with the interior woodwork, some of which needs renovating before re-varnishing. Any volunteers out there? 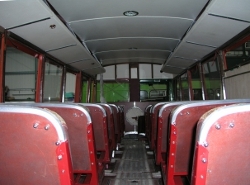 January 2012 - Some of the luggage racks are now finished, covered inside and out, and fitted in the saloon, with more to follow. The first aid box has been constructed and now fits in the first off side bay. This has been a 'delightful' job I'm told - but not in the Sgt Wilson sense! 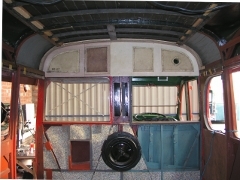 The bulkhead and the first bay have also received new covered panels, as has the area around the rear destination box. The cab door, and front cab windows are now in, together with the necessary wood trim and the sliding window area adjacent to the engine is being given some thought as I write this. The cab floor has received a new mat around the steering column and pedals - this being sourced many years ago from LRCC we think. April 2012 - All the luggage racks are now in (the last fit was very troublesome!) and are complete with bell pushes where necessary. A trial fit of the polished woodwork is also on going to see what is missing (the trim was taken off in 1965). A trial fit of the seats is also being undertaken - these are ex Ben Jordan's yard in Norfolk about 1975 we think! The cab is also receiving attention. 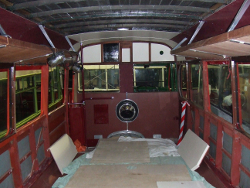 July 2012 - Work continues on the cab, with sliding runners and trim fitted to the nearside window area, and the saloon seat frames to ensure a neat and secure fit. All the seats have been positioned to ensure the spacings are correct before the drilling commences for the fitting! The interior panelling has been delivered - dark brown Formica is being used to replicate the similar coloured bakelite fitted in its later service life. It is hoped to start on the cutting of the sheets, and fitting these sections shortly. Missing polished trim is being made for the front bulkhead and window area, and for the backing for the interior light fittings. The first light unit to be fitted is above the rear seat. The entrance door sealing strip hus been fitted with new rubber. Another important step forward is the manufacture of two window fastenings for the sliding units. The chassis is also receiving another coat of black gloss to its interior frame, propshaft, axles and front end and the woodwork in the rebuilt boot area will be treated to more preservative. Many thanks to Peter, Dave E, Stephen D, Matt and John for their sterling work. October 2012 - The seat frames have been 'dry' fitted, removed and are being painted once again. The interior panels below the windows are now cut to size and fitted, with the finishing mouldings being prepared, stained and varnished. Some replacement mouldings have been made for the interior bulkhead, and some floor traps have received attention. All the seat cushions have been thoroughly hoovered and shampooed, likewise the seat backs. The latter have had some damage repaired too. Thanks to Peter, Dave E, Stephen D, Matt, John and Pam here. January 2013 - All the existing seats have been rebuilt with new foam. Local firm ABC Windows have fitted a new rear window. New trim is being sourced for the interior around the window. Work continues with the wood interior trim - including the bulkhead and light fittings and signage. The cab side panel is being renovated with many holes and damage being repaired. Some chassis cleaning continues. April 2013 - Work continues with all the interior fittings, particularly the front bulkhead trim which is proving to be fun to get it right! The rear destination box area has seen more work and is complete and looks lovely with the re-chromed handle, fasteners etc on the new covering . The life guard rails are now primed , undercoated and glossed. 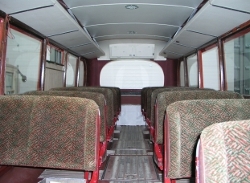 July 2013 - All the seats are now fitted and work continues on the interior lights and polished wood trim. 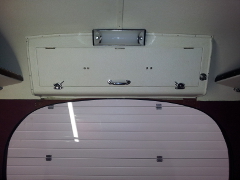 January 2014 - Further work on the drivers and emergency door has seen new buffers fitted, new hinge pins, interior trim and door mechanism. More interior trim has been produced, and prepared to replace missing items. 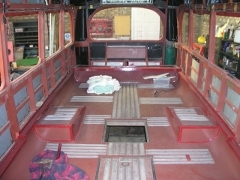 A new cab floor is being made and painted before fitting, together with other cab items being refurbished. The n/s front wing is receiving final work before painting. April 2014 - The wood finishers around the bulkhead have been manufactured, stained, varnished and fitted. Enquiries are being made with several companies to see if a missing opening window frame can be manufactured. The cables from the battery box to the starter motor and control box have been removed for replacement and the fitting of a master switch. July 2014 - FHN has had its front chassis cleaned of decades of oily filth, and has been painted in part. The wiring to the starter has been completed and a new master switch fitted. The sump has been removed, cleaned out and re-fitted, and the engine filled with new oil. 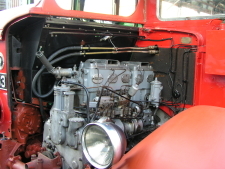 The engine has run on tick-over for an hour - the longest it has run for 50 years. January 2015 - The battery cables have been clamped up and the castle nuts and split pins on the brake system overhauled. Most of the chassis has now been de-greased and repainted. 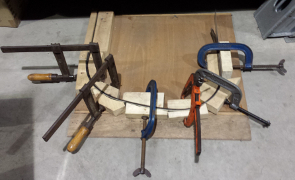 The curved wood in the cab is being formed using clamps and the patent steam box. April 2015 - The new window has been received back from Wessex Workshops. A start has been made on trial fitting the opening windows, though this cannot be competed until the small issue of chromium plating the brass is resolved. The curved wood on the emergency door has been finished and a start made on the curved wood for the cab. Painting continues with some of the body being painted in 'half and half' and the front wings finished in black. The blind on the front nearside bulkhead has been re-fitted. 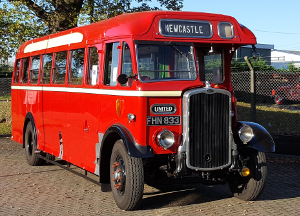 December 2017 - Progress has got as far as top coat being applied, with fleet names and lining out to come - 'FHN' was on display in the sunshine (but not quite ready to be on the road) at our November Transport Festival event. FHN 833 has now successfully been presented for MOT tests at the Lincoln MOT Centre. 'FHN' last held a Certificate of Fitness in 1963! The current FHN team who are all volunteers spend about 30 hours a week on the project on Monday and Wednesday evenings. We would welcome practical and especially financial help, as there are some expensive major projects still to be attempted. More about the restoration to date can be read here.